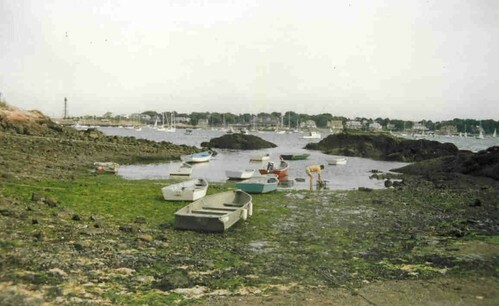 Town of Marblehead, MA, USA. I consider myself very lucky to have landed there; so much of the world outside my little enclave was dangerous and scary, but not my world. In high school I went through boyfriends like most people go through cereal. I fell “in love” over and over again, starting with my first “husband”, my neighbor Gary P., whom I married in our basement whilst in the 2nd grade; we got divorced in the 6th grade so I could go out with my new boyfriend, Bobby H. After that it was full steam down the track of love. My first “real” love was Jack D. After him it was Gary R., then Bill P., whom I married in 1970. When that went bust in 1976, of course, I fell in love again, this time with Steve I., and the next 9 years with Steve were lovely and crazy all at the same time. A lot of this time period of my life is material for another day, another time. …a guy I’d thought I’d been “in love” with, at the age of 14 as a freshman in high school. We had never really gotten to know each other. The year after I met him, at our church group, Pilgrim Fellowship, he had gone off to college, however, I always had a secret crush on him in my heart. It was July 1985. I left a note on his truck saying I had always wanted to go out on a lobster boat. He was, and still is, a lobsterman. He took me out with him that Saturday, and we never looked back. In about a month, we were planning our wedding for the following May. In 1986, Paul and I were married. Wow. We discovered, at the beginning of this quickly developing relationship, that we both had a dream… the same dream… of going to England to see the land where our hero, “James Herriot,” Yorkshire veterinary surgeon, lived, worked, and wrote his stories. We had a honeymoon to plan, and England/Yorkshire was our #1 choice. In May of 1986, newly married for just 2 days, off we went to England, flying overseas for the first time. What a trip. What a place. We both fell in love completely and forever with England, Scotland, and especially Yorkshire… our Yorkshire… the Yorkshire of James Herriot and All Creatures Great & Small fame. Back home after 3 weeks honeymooning all over England & Scotland, we went 3 years working and living life, buying our home, Crow Cottage, fixing it up, paying bills, and just counting down the days until we could get ourselves on a plane back across the pond to England once again – which we finally were able to do in 1989. We brought another couple with us, Angela & Bob, who also were great fans of James Herriot (Dr. Alf Wight in real life), and we set about trying to find him. Turns out our self-catering cottage was two doors up from Dr. Wight’s son’s home in Sutton-Under-Whitestonecliff, and we did, on the last day of our stay in Yorkshire that year, meet him when he appeared out of the blue in front of our cottage with his two dogs in tow, going to his son’s home for dinner. Autographs got signed in his books that we had brought with us. We had to pinch ourselves over and over that this had actually happened to us! After that, every two years we’d go to England again. We made eight trips there and back, but in 2002 we made our last one. The fun part of that last trip was that we were accompanied by a friend I had made online, Sandy from Iowa, and we actually met face-to-face when she flew out here two days before the three of us left for our eighth and her first trip to the UK. We’ve been best buddies ever since then. Sandy, Bex, Paul (sitting) and Jean Burluraux standing. Jean lives there in Yorkshire and hubby Don was snapping the picture. It’s been 10 14 years now and no more trips. My health issues and our financial situation have combined to prevent extravagances like that now. I keep hoping that someday, somehow, we’ll go back. Back in 2000, I left my job of 16 years as an office manager and took a job as a medical transcriptionist – something I’d done for many, many years prior to this job. I’d worked in hospital settings several times in several different states and always felt it was my calling… typing medical reports, so I’ve done that for the last 12 years, lucky enough to be able to work from home. Things change, and our medical transcription company closed up shop in October 2011. I retired. I am retired now and living on a fixed income with Paul still lobstering, probably for as long as his body will allow it. And that brings us to today, and this Synopsis of My Life. Hope this helps and wasn’t too long, too personal, too convoluted, or too boring! I’ve left out a lot of the spicy bits to protect the innocent (and the not-so-innocent). There are some things you don’t all need to know…maybe when I’m 84 I’ll write my memoir, and I’ll spell it all out then. But not before. I’ve a few years left til then!